Illustrated in Fig. 1, the Partnership composition, which includes all the European countries and is open to a global scenario, clearly shows the inspiration of the “network of networks”. The institutions included in the So.Re.Com.THEmaticneTwork operate in the field of Higher Education, addressing mainly post-graduate students (at the masters and doctoral level) and young researchers. Their teaching and research staff have an outstanding reputation in Social Representations and Communication, a specialised field open to multidisciplinary and multi-methodological approaches. Due to the very large partnership composition, the fig.1 not only indicates the composition of different networks and categories of the partners, but also identifies their different role and eligibility conditions in the project, by highlighting the various partner categories with different colours. The So.Re.Com. THEmatic NETwork is based in long established collaboration agreements with the most of the partners, in particular with the specialised scientific community in S.R.& C. including the ‘blue’, the ‘yellow’ , the ‘light green’ , the ‘dark green’ partners (see the above Figure 1 and tables). The University of Rome "La Sapienza" - European PhD on S.R. & C. (IT) is the lead institution and administrative centre. Boasts a multimedia training laboratory for European PhD students which will produce complete O.D.L. tool package and its designer and creator will be the owner of the copyright. Network ‘blue’, ‘yellow’, ‘light green’ and ‘dark green’ partners’ scientific input will be substantial and from various provenances. Technical support provided by the “pink” partners, including other specialised e-Learning and O.D.L. networks, Educational technology service of the Social Science Faculty of University of Helsinki, the Sim-Lab and “violet partners”, including commercial enterprises such as Marratech in Sweden, France Telecom, EDF-France. The ‘gray’ partners will act as governmental sponsors, in particular for the organisation of the meetings (which will be hosted at the Maison des Sciences de l’Homme in Paris), the International Summer School (hosted at the Castello Colonna in Genazzano) and the final EuroConference (which will be hosted at Comune di Roma) with the support of CantierEuropa. The ‘dark red’ and ‘dark yellow’ partners, which at the present do not include partners specialised in the disciplinary field of Social Representations and Communication, will act as enlarged scientific community for dissemination action of the multimedia tools produced by the co-ordinator with the scientific input of the specialised community. They will also play an active role for contributing in the Tuning approach to the harmonisation of the curricula in social sciences. 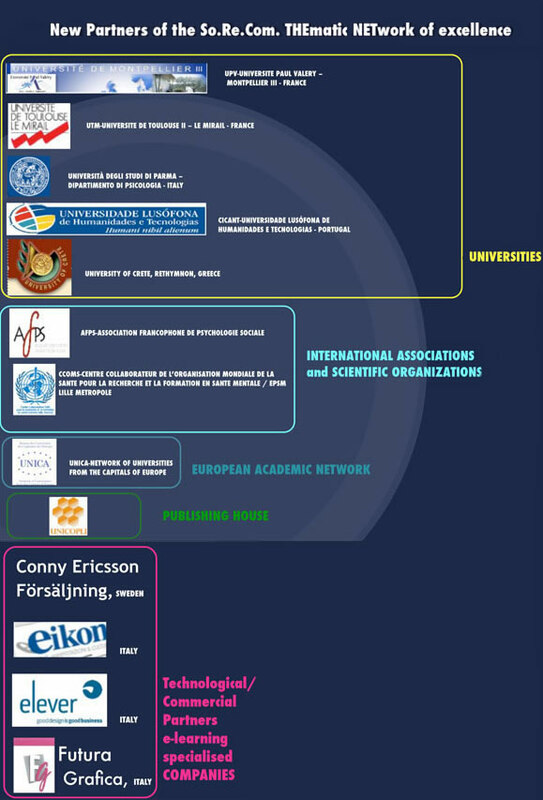 The “turquoise”partners will ensure the link of the SoReCom thematic Network with the student’s associations and professional organisation and the “teal” partners will still contribute to enlarge the dissemination effect among the world wide scientific community. Due to the dynamic exchanges over the project’s life, it might be possible that some partners – initially assigned to a category (for example to the ‘dark yellow’ for dissemination action) will shift to another category (for example ‘light green’ thanks to the discovery of their interest and competence in the specific scientific field and their active role in providing scientific input. The not eligible partners will participate in the project without any financial support; however – because of their expertise in the field – their contribution will be of great interest for its development and for enhancing co-operation between the more advanced scientific community working in Europe, the United States, and Canada and research groups working in under-developed regions. The researchers in Asia, Africa and Latin America, who might otherwise have access difficulties to the scientific material, can profit from the network's multimedia products and the ODL training system. N.B. = The Fig. 1. includes the Institutions included in the approved project proposal presented in February 2004. However – due to the time passed between the presentation of the pre-proposal (2003), its selection and the presentation of the full proposal (2004), its approval, the definition of the contract and the approval of the co-funding from La Sapienza University which made possible the implementation of the contract (2005) – some changes in the partner composition might occur, like cancellation of some sleeping partners and inclusion of new active partners. As soon the EC will make amendment in the contract, this list will be up-to-date.